I have used a cheap ATtiny13 (8pins) microcontroller which runs at internal 9.6MHz clock. It samples two channel analog voltage from the touchpad. One of the GPIO pin is configured as a software uart TX (bit banging) which will stream the mouse data at a baudrate of 115200 (may need to calibrate by changing OCR0A little bit up or down) to a PC via bluetooth (HC_05 bluetooth module). Apart from the mouse cursor movement, I have implemented left click, right click and wheels on the same touch screen. A python script running on the pc will accept the mouse data and it will process the data and apply a smoothing filter to make the cursor movement more efficient. Right now I did the code for linux but will be easily portable by small modification in the python code. Thanks !!! it cool !!! Where you buy this touchpanel ? 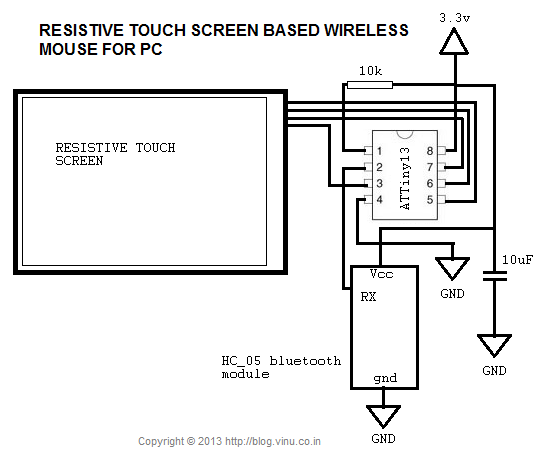 I want to build devices 'Resistive touch' + 'teensy++' as HID USB Keyboard\Mouse, you can help me this project? I can't compile the python code under windows , can you give me a compiled version (for windows) or correct the code? The error is on the 27th line. Can this be easily converted to Wacom RF digitizer modules? I suspect that a serial output is necessary for this to work. Correct? Great work and more than that is its ingeniousness. I had never thought of using a touch panel to control mouse. I have seen your other projects as well, all of them are unique!! I tried the mouse commands on my computer (using python) and all of them works flawless..
Wow, thanks for sharing all this information , i wanna try to make this device at this moment, thanks a lot man. Very cool device, interested in seeing more of it. Any thoughts on adapting this to work on an Android phone? I have my phone hooked up to my car in-dash tv and it would be nice to overlay the touchscreen on the car TV (currently no touch screen functionality) and then control my phone via the touchscreen/bluetooth! Cool project bro :D what is the touchpad (for what phone?) model and price ? so can i use 16MHz crystal to run this? i am nidhin ,i like this project very much,actually i had this idea before,but difference is i decided to use pic18f4550 for usb connection and rest all the same function like sensing co-ordinates of touch point . 1 . y we cant implement usb mouse(hid class ) on this project making it wired ?? i am new to python programming ,can u please explain python compiling ,which compiler u used in windows7 environment and how to compile it. Nidhin: You can implement it as wired usb hid using some controller having usb hardware / software usb stack like Vusb for avr. Also you can implement it as bluetooth HID . Is it possible to make a basic tutorial on how to start these things. I've got a samsung corby screen, and want to do something alike. I think any contemplations on adjusting this to deal with an Android telephone? I have my telephone snared to my auto in-dash television and it might be decent to overlay the touchscreen on the auto TV (as of now no touch screen practicality) and afterward control my telephone through the touchscreen/bluetooth! Hello I was wondering if you could port this to android at all? I know many other people would really like this also! Thank you. Very nice technology, your invention very cute and user friendly, where can buy this product in market?? can this code be used on raspberry pi ??? Mouse pad is for comfortable using of mouse.comfortable mouse pad provides with with the most smooth use of a mouse.The better the mouse tracks, the more you can enjoy mouse movements and working with it.A mouse pad can help you in better movement and better tracking as well. Excellent blog I visit this blog its really informative. By reading your blog, i get inspired and this provides useful information.